Launch of a US Army Nike Zeus missile, the first ABM system to enter widespread testing. The Anti-Ballistic Missile Treaty (ABM Treaty or ABMT) (1972—2002) was an arms control treaty between the United States and the Soviet Union on the limitation of the anti-ballistic missile (ABM) systems used in defending areas against ballistic missile-delivered nuclear weapons. Under the terms of the treaty, each party was limited to two ABM complexes, each of which was to be limited to 100 anti-ballistic missiles. Signed in 1972, it was in force for the next 30 years. In 1997, five years after the dissolution of the Soviet Union, four former Soviet republics agreed with the United States to succeed the USSR's role in the treaty. In June 2002 the United States withdrew from the treaty, leading to its termination. Throughout the late 1950s and into the 1960s, the United States and the Soviet Union had been developing missile systems with the ability to shoot down incoming ICBM warheads. During this period, the US considered the defense of the US as part of reducing the overall damage inflicted in a full nuclear exchange. As part of this defense, Canada and the US established the North American Air Defense Command (now called North American Aerospace Defense Command). 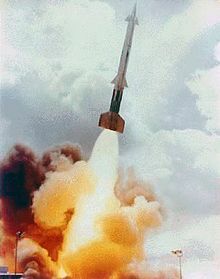 By the early 1950s, US research on the Nike Zeus missile system had developed to the point where small improvements would allow it to be used as the basis of an operational ABM system. Work started on a short-range, high-speed counterpart known as Sprint to provide defense for the ABM sites themselves. By the mid-1960s, both systems showed enough promise to start development of base selection for a limited ABM system dubbed Sentinel. In 1967, the US announced that Sentinel itself would be scaled down to the smaller and less expensive Safeguard. Soviet doctrine called for development of its own ABM system and return to strategic parity with the US. This was achieved with the operational deployment of the A-35 ABM system and its successors, which remain operational to this day. The development of multiple independently targetable reentry vehicle (MIRV) systems allowed a single ICBM to deliver as many as ten separate warheads at a time. An ABM defense system could be overwhelmed with the sheer number of warheads. Upgrading it to counter the additional warheads would be economically unfeasible: The defenders required one rocket per incoming warhead, whereas the attackers could place 10 warheads on a single missile at a reasonable cost. To further protect against ABM systems, the Soviet MIRV missiles were equipped with decoys; R-36M heavy missiles carried as many as 40. These decoys would appear as warheads to an ABM, effectively requiring engagement of five times as many targets and rendering defense even less effective. Jimmy Carter and Leonid Brezhnev signing SALT II treaty, 18 June 1979, in Vienna. The United States first proposed an anti-ballistic missile treaty at the 1967 Glassboro Summit Conference during discussions between U.S. Secretary of Defense Robert McNamara and Chairman of the Council of Ministers of the Soviet Union Alexei Kosygin. McNamara argued both that ballistic missile defense could provoke an arms race, and that it might provoke a first-strike against the nation fielding the defense. Kosygin rejected this reasoning. They were trying to minimize the number of nuclear missiles in the world. Following the proposal of the Sentinel and Safeguard decisions on American ABM systems, the Strategic Arms Limitation Talks began in November 1969 (SALT I). By 1972 an agreement had been reached to limit strategic defensive systems. Each country was allowed two sites at which it could base a defensive system, one for the capital and one for ICBM silos. The treaty was signed during the 1972 Moscow Summit on 26 May by the President of the United States, Richard Nixon and the General Secretary of the Communist Party of the Soviet Union, Leonid Brezhnev; and ratified by the US Senate on 3 August 1972. The 1974 Protocol reduced the number of sites to one per party, largely because neither country had developed a second site. The sites were Moscow for the USSR and the North Dakota Safeguard Complex for the US, which was already under construction. The Treaty limited only ABMs capable of defending against "strategic ballistic missiles", without attempting to define "strategic". It was understood that both ICBMs and SLBMs are obviously "strategic". Neither country intended to stop the development of counter-tactical ABMs. The topic became disputable as soon as most potent counter-tactical ABMs started to be capable of shooting down SLBMs (SLBMs naturally tend to be much slower than ICBMs), nevertheless both sides continued counter-tactical ABM development. On 23 March 1983, Ronald Reagan announced the Strategic Defense Initiative, a research program into ballistic missile defense which would be "consistent with our obligations under the ABM Treaty". Reagan was wary of mutual deterrence with what he had recently called an "Evil Empire", and wanted to escape the traditional confines of mutual assured destruction. The project was a blow to Yuri Andropov's so-called "peace offensive". Andropov said that "It is time [Washington] stopped thinking up one option after another in search of the best way of unleashing nuclear war in the hope of winning it. To do this is not just irresponsible. It is madness". Regardless of the opposition, Reagan gave every indication that SDI would not be used as a bargaining chip and that the United States would do all in its power to build the system. The Soviets were threatened because the Americans might have been able to make a nuclear first strike possible. In The Nuclear Predicament, Beckman claims that one of the central goals of Soviet diplomacy was to terminate SDI. A surprise attack from the Americans would destroy much of the Soviet ICBM fleet, allowing SDI to defeat a "ragged" Soviet retaliatory response. Furthermore, if the Soviets chose to enter this new arms race, they would further cripple their economy. The Soviets could not afford to ignore Reagan's new endeavor, therefore their policy at the time was to enter negotiations with the Americans. By 1987, however, the USSR withdrew its opposition, concluding the SDI posed no threat and scientifically "would never work." SDI research went ahead, although it did not achieve the hoped-for result. SDI research was cut back following the end of Reagan's presidency, and in 1995 it was reiterated in a presidential joint statement that "missile defense systems may be deployed... [that] will not pose a realistic threat to the strategic nuclear force of the other side and will not be tested to... [create] that capability." This was reaffirmed in 1997. Although the Soviet Union ceased to exist in December 1991, in the view of the U.S. Department of State, the treaty continued in force. An additional memorandum of understanding was prepared in 1997, establishing Belarus, Kazakhstan, the Russian Federation, and Ukraine as successor states to the Soviet Union, for the purposes of the treaty. Supporters of the withdrawal argued that it was a necessity in order to test and build a limited National Missile Defense to protect the United States from nuclear blackmail by a rogue state. The withdrawal also had many critics. John Rhinelander, a negotiator of the ABM treaty, predicted that the withdrawal would be a "fatal blow" to the Non-Proliferation Treaty and would lead to a "world without effective legal constraints on nuclear proliferation." The construction of a missile defense system was also feared to enable the US to attack with a nuclear first strike. Putin responded to the withdrawal by ordering a build-up of Russia's nuclear capabilities, designed to counterbalance U.S. capabilities. Russia and the United States signed the Strategic Offensive Reductions Treaty in Moscow on 24 May 2002. This treaty mandates cuts in deployed strategic nuclear warheads, but without actually mandating cuts to total stockpiled warheads, and without any mechanism for enforcement. In interviews with Oliver Stone in 2017, Russian president Vladimir Putin said that in trying to persuade Russia to accept US withdrawal from the treaty, both Bill Clinton and George W. Bush had tried, without evidence, to convince him of an emerging nuclear threat from Iran. On 1 March 2018, Russian president Vladimir Putin, in an address to the Federal Assembly, announced the development of a series of technologically new missile systems and stressed that those were designed as a response to U.S. withdrawal from the ABM Treaty. His statements were referred to by the Trump administration officials as largely boastful untruths, but also as confirmation that "Russia ha[d] been developing destabilizing weapons systems for over a decade, in direct violation of its treaty obligations". ^ "Treaty Between the United States of America and the Union of Soviet Socialist Republics on the Limitation of Anti-Ballistic Missile Systems". Bureau of Arms Control. United States Department of State. 26 May 1972. ^ "Moscow extends life of 144 cold war ballistic missiles". The Guardian. London. 20 August 2002. Retrieved 24 October 2006. ^ "ABM treaty reduces US and USSR to one ABM site each". The Nuclear Information Project. FAS. Retrieved 27 May 2011. ^ a b Ivo H. Daalder (May 1987). "A tactical defence initiative for the Western Europe?". Bulletin of the Atomic Scientists. 43: 37. Retrieved 8 February 2011. ^ Garthoff, Raymond L. (1994). The Great Transition: American-Soviet Relations and the End of the Cold War. Washington, D.C.: Brookings Institution. p. 99. ISBN 978-0-8157-3060-6. ^ "Replies by Yu. V. Andropov to Questions from a Correspondent of Pravda". Pravda. 27 March 1983. Cited in Garthoff, Raymond L. (1994). The Great Transition: American-Soviet Relations and the End of the Cold War. Washington, D.C.: Brookings Institution. p. 111. ISBN 978-0-8157-3060-6. ^ Peter R. Beckman et al., The Nuclear Predicament: Nuclear Weapons In The Cold War And Beyond, 2nd ed. (New Jersey: Prentice-Hall Inc, 1992), 183. ^ "Fact sheet: Memorandum of understanding on succession". United States Department of State. 26 September 1997. Although the ABM Treaty continues in force, it nevertheless has become necessary to reach agreement as to which New Independent States (NIS) would collectively assume the rights and obligations of the USSR under the Treaty. ^ "U.S. Withdrawal From the ABM Treaty: President Bush's Remarks and U.S. Diplomatic Notes". Arms Control Association. Retrieved 10 February 2014. ^ Majumdar, Dave (1 March 2018). "Russia's Nuclear Weapons Buildup Is Aimed at Beating U.S. Missile Defenses". The National Interest. USA. Retrieved 26 October 2018. ^ Stone, Oliver. "The Putin Interviews (Party 2 - 2:10)". www.sho.com. Showtime. Retrieved 12 November 2018. ^ "Presidential Address to the Federal Assembly". kremlin.ru. 1 March 2018. ^ Exclusive: Putin blames U.S. for arms race, denies 'new Cold War' NBC News, 1 March 2018. ^ Dall, Augusto César (20 July 2018). "Beyond Russia's Development of New weapons: Insights From Military Innovation and Emulation Theory". Boletim de Conjuntura Nerint. ^ Putin claims new 'invincible' missile can pierce US defenses CNN, 1 March 2018. Anti-Ballistic Missile Treaty, official State Department site, includes the text of the treaty and the 1974 Protocol.